My wife and I agree on most things. But not everything. We share many similar values and beliefs; we also have very different life experiences and perspective. When she told me she didn’t approve of a few of my parenting habits recently, my first reaction was to feel hurt, sad and then angry. After listening carefully to her concerns and requests, I quietly withdrew into myself to consider what she’d said, promising aloud that it wouldn’t be too long before I was ready to respond or at least continue our conversation. Once my sadness began to lift (along with my unhelpful “don’t tell me what to do” attitude) and I settled back into recognition of her goodwill, love, commitment, and intentions, I realized we needed to reconsider and discuss expectations we both have about decision-making in our family and relationship. The issue wasn’t the areas of disagreement between us – none of them are difficult to work out — but my feeling that she was infringing on an area I “assumed” was my autonomy. What we needed to work out went beyond what activities I’d do with our delicious soon-to be-four-year-old son after school or what snacks I’d give him; it was deciding together whether those were decisions (a) I had a right to make independently, (b) decisions I needed to make with her input, (c) decisions we needed to agree upon, (d) decisions she’d make with my input, or (e) decisions that were entirely hers to make. 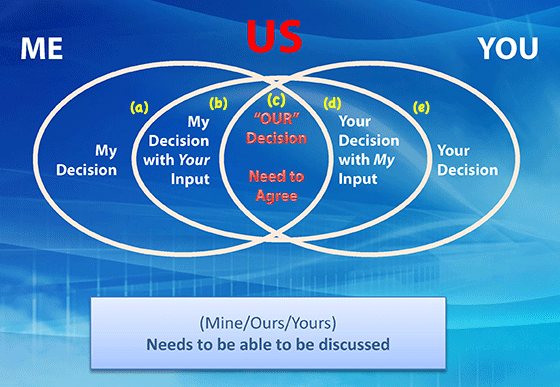 Once we agreed where different areas of decision-making went in our Powergram based on our shared values, beliefs and relationship vision, working out disagreements was easier. Working through the areas where we don’t agree takes goodwill, empathy, mutual respect, a commitment for the relationship to win, and emotional maturity. More specifically, we needed to create a Powergram that fit for our shared relationship vision, goals and expectations. For the challenge we were facing, that could help us create a better marriage. The Powergram, shown above, is three intersecting circles. The exercise is one of the most important skills couples learn in PAIRS Foundation‘s marriage and relationship education classes. On each end are areas of personal autonomy. Immediately next are areas of personal autonomy with input (meaning you check it out with the other person first). Most important is what’s in the middle. That’s very much where the “we” of our relationship lives. Those are the decisions we recognize require agreement. Interactive exercises to find out if your serious new relationship is meant to last. There are no set relationship rules for what goes where in any family or couple’s Powergram at any given time. Decision-making responsibilities can change as circumstances and life’s natural transitions require. For example, as children get older, if we need to make financial adjustments, when there are health issues, or if one of us is traveling or preoccupied with responsibilities outside the home for an extended period, etc. Here are some of the most common areas of decision-making for couples and families, although there are many, many more. Considering where you and your spouse will put each area in your Powergram can help you head-off marital conflict and relationship power struggles before they begin and create a better marriage. It may turn out to be the best marriage advice ever. Seth Eisenberg is President/CEO of PAIRS Foundation, a longtime industry leader in marriage and relationship education.